Getting on top of your career requires one to sharpen one's skills and gain insightful knowledge. We facilitate corporate/ professional trainings through our partner institutions abroad. The courses are fashioned to equip the attendants with recent developments in ensuring optimal performance. courses could also be customized to clients demand. We provide Visa application support, Hotel booking and Flight booking arrangements. We will ensure your next holiday is all you hope it to be. Why not Contact us to know of our upcoming travel packages for you and your family? 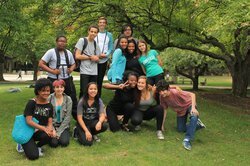 We provide summer camp experience for students in high schools. Eligible students are between ages 10 to 16 years old. Secondary schools interested in any of our forthcoming summer programs should not hesitate to contact us. We provide summer camp experiences to the UK, USA, Canada, Europe and South Africa.